What a great day for the sport of agility. For those of us at home on AgilityVision it was a solid eight hours of livestreaming - the hybrid course, the challenger course and the finals. Holy smokes there were some great runs! I rooted for the Dylan the rat terrier in the 16" challenger round - that team went on to win NAC in the 16" division. Congratulations Dylan and his handler Angie Benacquisto - what a run! I had to dig a bit to understand how the rest of the rounds were scored and how teams moved on. The hybrid course was round three - all of the entries were entered in the hybrid round. Of the three rounds a total of 300 points were possible and course times were added together to come up with an aggregate score. The top 7% of dogs moved onto the finals directly. There were a number of dogs - who placed in one of the first three rounds (but didn't qualify as one of the automatic finalists. These folks were entered into the challenger round. The winner at each height class (including preferred) won their way into the final round. The total number of finalists at each height class was based on the total number of dogs entered at that height group. So the top 18 20" dogs went on to the final - plus the winner of the 20" challenge division. And then there was a similar number on the preferred side. There was an interesting anomaly in the preferred side - something like 80% of the preferred dogs made it to the final round. In the 20" division only 7% of the dogs made it through to finals. Since this was the first year that there have been entries and divisions for the preferred dogs I'd imagine there were fewer dogs entered than we'll see next year. And I'd imagine that AKC will go back and look at their metrics a bit. Dogs had to run their measured jump heights this year. In past years a 17.5" border collie could run in the 20" class - and most 17.5" border collies do run in the 20" classes - or that's my observation anyway based on what I see in New England. For the NAC there were a lot (LOT) of border collies in both the 16" regular and in the 12" preferred. I think that changed the game a bit for other dogs that compete in the 16" division. There weren't many shelties in the 16" regular finals. Alternatively these same 17.5" BCs could have jumped 26" (as 26" is an optional height class open to dogs of all heights). Let's see - 16" or 26". I guess I don't understand why AKC decided to force people into their height class. If a handler can make the decision to jump their 17.5" border collie at 26", why can't that handler decide to jump them at 20"? 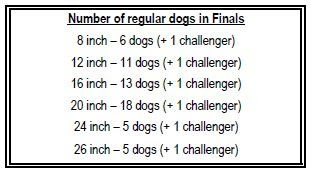 Especially since those dogs can jump 20" at every other AKC agility trial - but at nationals they have to jump their measured height. The NAC had 24" weave poles. If the AKC is going to standardize their national championship event with the 24" poles they need to come out and make the 24" decision across the board for all trials. Make the rule effective immediately - it's the right thing to do for our dogs. Get it done.